The de Havilland DH60 Gipsy Moth was first flown on the 22nd of February 1925. The brainchild of Geoffrey de Havilland, the Gipsy Moth was the first affordable light aircraft capable of bringing flying within the reach of ordinary people. The aircraft became the basis of the formation of the flying club movement in Britain and elsewhere. 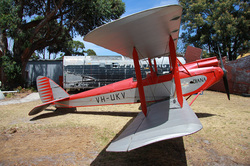 Over 800 were built, including 32 examples by the Larkin Aircraft Supply Company in Melbourne. The Gipsy Moth was the aircraft used by many pioneering pilots including Amy Johnson and Francis Chichester. Gipsy Moths were used by the RAAF as trainers before and during World War 2, eventually 122 saw military service. The Museum’s Gipsy Moth was built in 1929 and is the oldest complete aircraft in the collection. It had an adventurous career, including two round trips to New Guinea in the 1930’s. It was the first aircraft to air deliver the HERALD newspaper in Victoria and was pressed into military service in World War 2. It was donated to the Museum in 1965.